These cookies are so YUMMY but they do take a while to make. Mix powdered sugar, margerine, shortening, egg, almond, and vanilla. Divide dough, color 1/2 red. Shape 1 tsp each color into 4 inch rope. 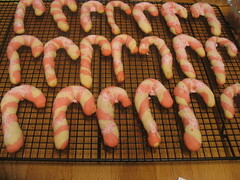 Twist together into candy cane shape. Bake on ungreased sheets for 9 mins at 375 F.
Mix candy and sugar. Sprinkle immediately over cookies after baking. Cool on racks. Coming January: CTMH's new catalog!